What does the SRC do with my money? Do I need to recertify each year? What is the cost to become a referee? How much do I get paid to referee? How do I get assignments? Who has signed up for a course? When is an assessment required? Who Pays for My Assessment? How do I request an assessment? How do I get paid for an assessment? How/When do I post an assessment in GameOfficials? How do I become an assessor? What to do if I can’t find referees for games, tournaments? How do I check the certification status of a referee? How do I apply for a tournament? How does a referee get game assignments? Our organization – the South Carolina Referee Association (also known as the South Carolina Referee Committee) - is part of the national United States Soccer Federation (USSF). Every state has a similar organization and all state organizations are structured the same with minor variations and all operate with the same set of rules and guidelines. . 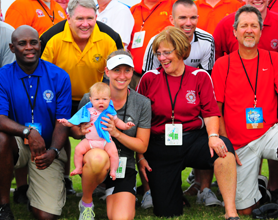 The goal of each state organization is to provide soccer referees in support of all USSF affiliated adult and youth soccer organizations (and leagues) within each state. That includes the recruitment, education, evaluation (assessments), and assignment of all certified referees within each state. Each year, referees must recertify in order to referee games for the following year.